The What: Sony has released version 1.1 of its flagship interactive collaboration and active learning solution, Vision Exchange. The upgrade includes integration of Skype for Business for global collaboration, as well as the addition of Personal Note Taker to enhance interactive learning. The What Else: From June 2018, Vision Exchange will be upgraded to the version 1.1 to implement these workflow improvements and support interactive teaching within lecture-style classrooms. The updates to Vision Exchange aim to eliminate any logistical remote learning issues and improve collaboration and communication. The update applies to the two main unit series PEQ-C100, PEQ-C130, and Pod PC Software PES-C10. The updated software will be available at no additional cost for the first year of purchase. This will ensure that existing V1.0 owners can take advantage of the new V1.1 software. For future updates, Sony offers the Software Upgrade Program (SUP) that will provide users with an annual subscription to ensure their version always remains up to date with advanced features and a stable operation. 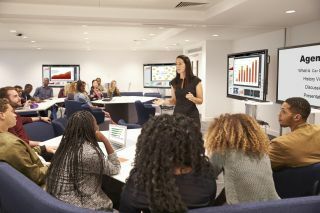 Vision Exchange’s existing Interactive Mirroring function enables users to connect and share any source within the classroom. The new Personal Note Taker takes this one step further, enabling students to refer, capture, write, and save the main screen content using their own devices to review later. The Bottom Line: This update to Vision Exchange is designed to improve educational workflows and fits into Sony’s goal of continuously developing new functionalities and operational efficiencies in response to customer demand. Vision Exchange also remains compatible with all of Sony’s Interactive BRAVIA professional displays, enabling customers to AV solutions for education environments.